On the afternoon of Tuesday, September 19, Retail Insider’s Craig Patterson is hosting a tour of Toronto’s Bloor-Yorkville area in partnership with Interior Designers of Canada, and the Professional Retail Store Maintenance Association (PRSM). The tour will focus on the future of the area, which is seeing an unprecedented transformation at a cost of hundreds of millions of dollars. Architectural highlights and design will be featured, and it concludes with a networking reception at the Gardiner Museum on Avenue Road. To register for the event, please contact Scott Kettles, Business Development Manager, at skettles@idcanada.org to register for this event. Tour & Networking reception cost is $40 or if just attending Networking reception cost is $20. The tour will begin at the Marriott Bloor Yorkville Hotel at 90 Bloor Street East, and will head westward towards the iconic intersection of Yonge and Bloor, located directly above Canada’s busiest subway stations. At the southeast and southwest corners are two substantial developments — One Bloor Street East features a nearly completed 75 storey tower will a substantial commercial podium, and One Bloor West, aka ‘The One’, will feature seven levels of retail at the base of an 80 storey condominium tower, in a project unlike any seen in Canada to date. 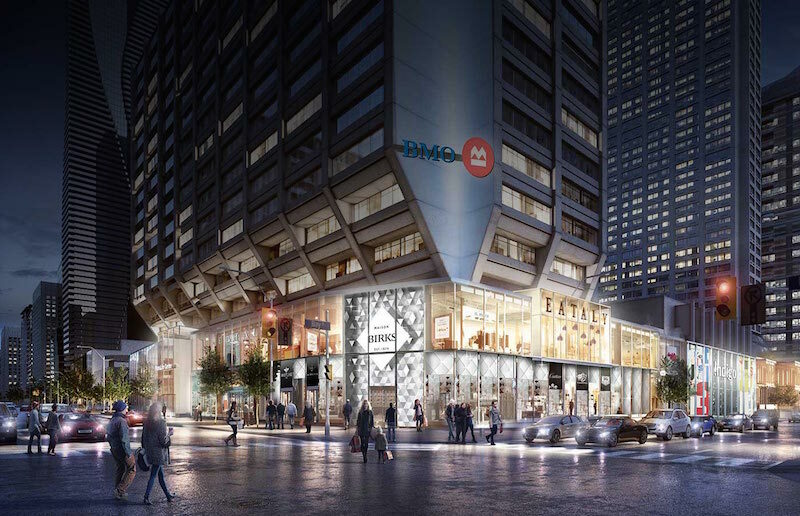 The tour will then head westward along Bloor Street West, with a visit to the Manulife Centre (55 Bloor St. W.), which is undergoing an expansion and overhaul that will cost in excess of $100 million. When completed, the new retail podium will include Italian food concept Eataly, as well as a number of new first-in-class retailers. Across the street, Holt Renfrew’s global flagship is about to see some substantial changes. Happening now, Yorkville Avenue is being redeveloped under the guidance of landlords such as First Capital Realty to create a ‘luxury zone’ of stores and restaurants that is expected to be similar to Rodeo Drive in Beverly Hills when completed. Chanel’s 8,700 square foot Canadian flagship at 100 Yorkville Avenue, opening in November, is one of the highlights. The tour will then continue southward and then eastward along Cumberland Street, noting a number of historic buildings that have been repurposed for retail — not to mention Nespresso’s jaw-dropping 14,000 square foot premises. The tour then heads south along Bellair Street (past Retail Insider’s headquarters) onto Bloor Street West, where the tour will detail what’s to come at the historic 'The Colonnade' at 131 Bloor Street West, which is again undergoing a transformation. The Colonnade has a remarkable history, having been Canada’s first mixed-use building to include a retail shopping concourse, office space, and residential in the same building. Other soon-to-open retailers on the strip include Hermes, Dior, Moncler, and a new flagship for the world’s largest tableware retailer, William Ashley. Arconas, Platinum Sponsor of this event, is celebrating their recent partnership with Green Furniture Concept as the exclusive distributor of their products to any commercial space in Ontario, and to airports throughout the Americas. Green Furniture Concept is an award-winning Swedish company that creates sustainable, indoor wood seating and acoustic lighting solutions for public spaces. On display for event guests to experience will be the company’s signature Nova C Bench Series and Leaf Lamp Trees. Nova C wood benches are available in a variety of finishes and offer the flexibility to design seating configurations as unique as your space through modular pieces. The Leaf Lamp Series consists of a unique ambient and acoustic lighting solution made entirely of natural materials. Floor mounted or hanging leaf lamp options bring a whimsical yet elegant charm to each space.